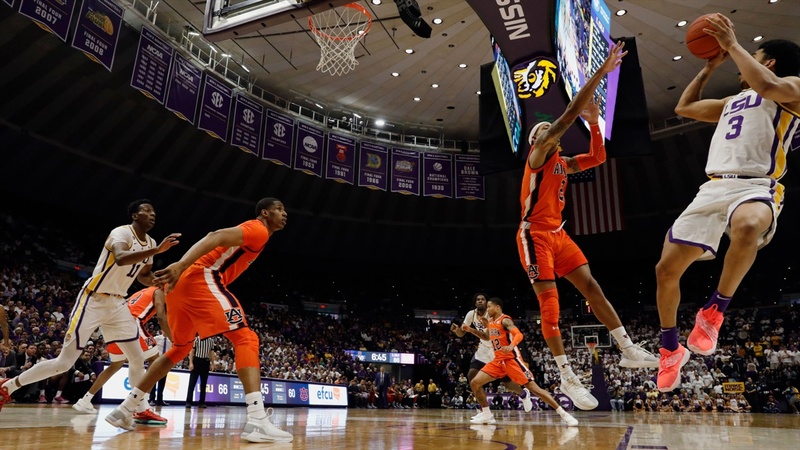 Tremont Waters recorded a double-double with 19 points and 10 assists and Skylar Mays scored 20 points as LSU rallied in the second half for an 83-78 victory against Auburn in a Southeastern Conference game at the PMAC on Saturday afternoon. Trailing by three points at halftime, LSU went ahead 45-43 on a 3-pointer by Waters three minutes into the second half. After Jared Harper tied the score with two free throws, LSU went on a 19-9 run which covered about eight minutes. Waters started the outburst with two 3-pointers. Darius Days and Marlon Taylor also knocked down 3-pointers in that stretch. Naz Reid’s field goal with 8:43 remaining in the game put LSU on top 64-54. LSU did have to weather a late rally in which Auburn cut its deficit to one point with 26 seconds to play. Waters did not have the best of shooting days as he missed 12 of his 17 field goal attempts. Only one of his twisting layups in the lane went through the basket. However, he made four 3-pointers in 10 attempts. Three of those four 3-pointers came in the first five minutes of the second half when LSU took the lead. Waters also finished with 10 assists and just two turnovers. The ten assists were the most by Waters since he had 11 last month at Arkansas. LSU’s starting lineup consisted of Bigby-Williams and Reid in the post, Mays and Taylor on the wings and Waters at point guard. All five starters played more than 20 minutes. Smart played 27 minutes off the bench. Both Mays and Waters were on the floor for 36 minutes. . .Mays had another rough shooting game as he was 5-of-14 from the field, including 2-of-7 on 3-pointers. But, Mays made eight of his 10 free throw attempts. He sank two foul shots with 23 seconds remaining in the game with LSU’s lead down to one point. . .Reid continued his solid play with his second straight double-double. Reid made six of his 11 field goal attempts. He missed all three of his 3-point shots. . .Bigby-Williams was a factor on the boards with 11 rebounds, including seven on the offensive end. He was 3-of-5 from the field. . .Taylor also came up big on the glass with seven rebounds, including five offensive boards. Taylor’s seven rebounds matched his season-high. . .Days was LSU’s best performer off the bench with eight points in 13 minutes. Days was 3-of-4 from the field, including 2-of-3 on 3-pointers. . .Williams had four points and four rebounds in seven minutes. . .Smart had a tough day with just one made field goal in 10 attempts. Smart had three steals, as did Waters and Mays. . .Auburn made 58 percent of its 3-point shots in the first half (11-of-19). But, Auburn connected on just 26 percent of its shots behind the 3-point line in the second half (5-of-19). . .For the third time this season, LSU won a SEC game in which it made less than 40 percent of its shots from the field. LSU won games at Texas A&M and Missouri in which it failed to shoot 40 percent from the field. . .Reid’s basket with 2:40 remaining in the game put LSU ahead 77-67. Auburn made one last rally. A 3-pointer by Harper with 30 seconds left Auburn behind 79-76. Following a LSU turnover, a layup by Okeke put Auburn behind 79-78 just four seconds later. Mays pushed the LSU advantage back out to three points with two foul shots. Harper missed a potential game-tying 3-point shot with nine seconds to play. Smart rebounded the missed shot, but had the ball stolen by Harper. Brown then missed a hurried 3-point shot. Waters hit two free throws inside the last second. . .LSU is 19-4 overall, 9-1 in the SEC. LSU has won nine of its first ten conference games for the first time in ten seasons. LSU began the 2009 SEC schedule with a 13-1 record. . .LSU ended a three-game losing streak against Auburn. . .Auburn is 16-7 overall, 5-5 in the SEC. . .The paid attendance was 12,004. The actual crowd was a little more than 10,000. LSU will play Kentucky at Rupp Arena in Lexington on Tuesday. Tipoff is scheduled for 6 p.m. Central. The Wildcats (20-3, 9-1) defeated Mississippi State 71-67 in Starkville on Saturday afternoon. The LSU-Kentucky game will be available on ESPN.